River rafting in Ladakh is quite unique as compared to the rest of the country because of the region’s fierce, untamed and chilly waters. The river waters run down fearlessly from valleys, cut through rocks, and pass by colourful monasteries and ancient canyons. Rafting in these rivers is set against the mesmerizing landscape of brave chilly winds and freezing waters. In Ladakh, you can do river rafting in the Indus River and the Zanskar River. Indus is the longest river in Asia and the Zanskar river is one of its main tributaries. 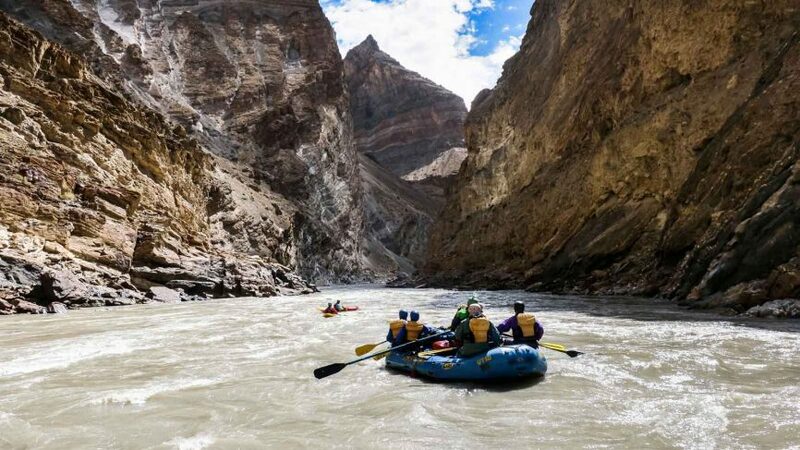 Although the Indus river just originates here, its force and intensity are quite formidable which makes the rafting experience an exhilarating experience. The whitewater Indus river rafting in Ladakh has rapids that are generally of I and II grades. At some places, you can experience III to V grade rapids. The Zanskar river joins the Indus river at Nimo, a village just outside Leh, which creates a gorgeous blue-green confluence of the two rivers. This confluence is one of the best places to experience river rafting in Ladakh. Rafting through this confluence takes you through a beautiful scenery consisting of tiny hamlets, ancient monasteries and imposing mountains. Making this a quintessential part of your Ladakh tour package will make this trip to the mountains one to remember for an entire lifetime. You can also go whitewater rafting on the Zanskar river. The force of the water along with its tricky twists and turns would surely give you the adrenaline rush that you seek. This river is frozen in winters but is in full flow during the summer and monsoon seasons. Although the adventure-laden route is mostly until the confluence, this river also offers its fair share of river rafting thrills through points such as Alchi, Schorpochay, Phay and Sangam. The best time to go river rafting in Ladakh is during the monsoon months of July, August, and September. In winters, these rivers remain frozen and in summer, they’re just getting their flow started. Monsoon is when these waters are in their full-flow. For anyone who wishes to get a taste of adrenaline on their Ladakh tour, including river rafting in their Ladakh tour package would prove to be the ultimate experience - an exhilarating and truly unforgettable adventure.